Where? On beautiful Galiano Island. Accommodation at Bodega Ridge. 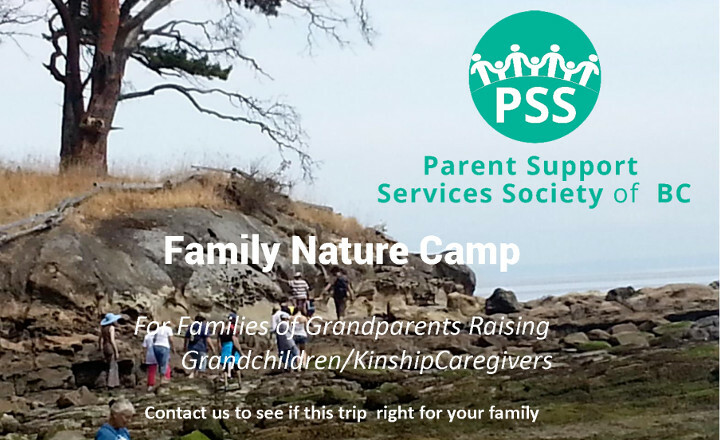 Nature programming by Galiano Conservancy Association. Cost? PSS fundraises to cover the costs of: ferry, accommodations, food and activities. You need to pay: your own way to Swartz Bay or Tsawwassen ferry terminals; parking if required; and bring a bagged lunch for the first day! Is it the right fit for your family? It is best suited for young children 5 years to 12 years and who are able to do well in a group setting. There is considerable time spent walking (sometimes on uneven terrain) during the Conservancy programming (all 3 days). Cabins will be shared to allow as many families as possible to participate (Families will not be separated). Children are expected to participate in all programming. Grandparents/Kinship caregivers are responsible for their children. Applications considered on a first come, first served basis. Priority for those never been to our Kinship Family Camp. To apply – read over the Participant Package and click on the link on the last page. Or contact our Support Line 1-855-474-9777 for assistance.